ANAB established the Terry Burgess Assessor of the Year Award to recognize outstanding service by its contract assessors. The award was established to honor the memory of a valued ANAB employee. After serving in the U.S. Air Force and industry, Terry Burgess joined ANAB as an assessor and later became an Accreditation Manager for calibration. She retired from ANAB following a recurring cancer diagnosis in 2016, and she died in October of the same year. During her time with ANAB, she contributed much more than her job required and she was a trusted colleague and friend to the ANAB team and others.ANAB is seeking nominations for the second annual award; if you wish to nominate someone, please use the online nomination form. Nominations for the next award are due November 1, 2019. Only contract assessors for the management systems SBU and contract lead assessors for the lab-related or forensic SBUs are eligible for the award. All nominations should include a narrative of why the assessor is being nominated and should focus on the following selection criteria: teamwork, going the extra mile, customer service, professional advancement, creativity and innovation, performance excellence, leadership skills, and commitment. Deedra Hughes is the recipient of the second annual Terry Burgess Assessor of the Year Award. Established to honor the memory of a valued ANAB employee, the Burgess Award recognizes outstanding service by an ANAB contract assessor. 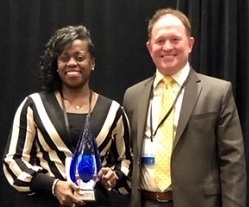 The award was presented to Hughes on January 23, 2019, in conjunction with ANAB’s assessor development sessions in Nashville. Hughes, who has been a contract assessor with ANAB since 2010, was recognized for her exceptional professionalism, dedication, and customer service in providing assessment for accreditation of forensic testing agencies. She has more than 18 years of experience with the Mississippi Crime Laboratory, examining items of physical evidence for biological fluids, performing DNA analyses, and conducting statistical analyses on DNA profiles. Hughes serves as the DNA technical leader and the administrator of the laboratory’s Combined DNA Indexing System (CODIS), the FBI’s program of support for criminal justice DNA databases that enables federal, state, and local forensic laboratories to exchange and compare DNA profiles electronically to link violent crimes to each other and to known offenders. The first annual Terry Burgess Assessor Award was presented in January 2018 to Steve Holladay, who has been working with ANAB since 1992, first as a volunteer Accreditation Council member and subsequently also as a management systems accreditation assessor.